Belgian Gymnastics: Olympic Test Event: the Women's team qualifies a full team to the Olympic Games! Olympic Test Event: the Women's team qualifies a full team to the Olympic Games! In Rio, Belgium was ready to achieve its longtime goal and qualify a full team to the Olympic Games for the first time! And they did it with style, finishing in 3rd place. The gymnastics world is changing and evolving fast. New countries are emerging. Countries like Belgium. The team that was sent to Rio was a mix of veterans and newcomers. Pressure was high as a lot of people expected Belgium to succesfully qualify for the Olympic Games. But the team was confident and they were right to be. Before the Test Event, there were about 6 countries that could have qualified for the Games : Romania, France, Germany, Belgium, Brazil and Australia. The girls were in the last subdivision, along with France, meaning they had to wait all day. And they even got to wait a bit longer as a power cut in the arena resulted in an hour delay. But Belgium didn't let that incident get in its way. Starting on vault, Laura Waem, Axelle Klinckaert, Gaelle Mys, Rune Hermans and Julie Croket all performed clean full twisting Yurchenko, the best score being a 14.200 for Axelle's performance. On bars, Senna Deriks was the best Belgian, scoring 14.333, followed by Laura Waem (14.200). Julie Croket unfortunately fell on balance beam (12.833) but her score didn't impact the team's total as Axelle Klinckaert (13.966), Rune Hermans (13.833), Gaelle Mys (13.833) and Laura Waem (13.700) got better scores. 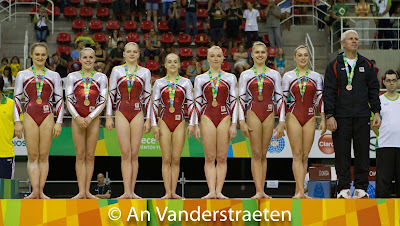 Finishing up on floor, all they needed was an average of 51 points, easily doable for Belgium. And they didn't even had to wait the last gymnast to go to qualify as Rune Hermans' score was enough to put them in third. Axelle Klinckaert nonetheless performed her routine without pressure and then got to celebrate this historic moment with her teammates. Because what they did is historic. For the first time, Belgium will send a full team to the Olympic Games. After falling short 4 years ago in London, the team fought till the end and brilliantly achieved its longtime goal. With only one mistake (which didn't matter in the end), they proved their consistency and that they could perform extremely well under pressure. They also improved their Worlds team score by almost 2 points. In event finals yesterday, Senna Deriks (14.266) and Laura Waem (13.266) placed 6th and 8th respectively on bars. Along with Brazil, easy winner of the Test Event, Germany and France, Belgium joins the teams from the United States, China, Great Britain, Russia, Italy, Japan, Canada and the Netherlands in Rio. In August, all the girls will achieve will be pure joy and experience. We know they are capable of great things, and as Yves Kieffer said, "at the Games, anything can happen". I'd like to say a few words about Australia and Romania to finish. Australia placed 5th, and I'd like to say how impressed I was by this team, because they fought hard. They lost some of their best gymnasts shortly before the Test Event, as Mary-Ann Monckton, Emily Whithead and Lauren Mitchell were injured. But Australia still competed with all its guts. And finally, I'd like to say a word about Romania. As I said at the beginning of this article, the gymnastics world is evolving. For the first time since 1968, Romania has failed to qualify for an Olympic Games. This beautiful team of young talents had disastrous meets in both Glasow and Rio and even the return of the great Catalina Ponor couldn't change that. Of course, they lost Larisa Iordache and Laura Jurca through injuries and maybe things could have been different with them on the team. It will be weird not to see Romania at the Games, especially on the 40 years anniversary of Nadia Comaneci's first perfect 10. I wish them all the best and hope they will bounce back from this. Now, Team Belgium will take a short break before coming back to the gym and focus on the Belgian and the European Championships. And then, it will be time for the Games!